St. Francis depicted in Giotto's 13th-Century painting Predica agli uccelli. Credits: christusrex.org. Even the most optimistic among us would not dispute that our world is currently in a desperate state. From climate change to armed conflict, from pollution to widespread inequality, humanity suffers from innumerable afflictions. While some afflictions are more recent phenomena than others, how we cope with this suffering, and how we go about reducing the pain we inflict on ourselves and others, are dilemmas as old as humankind itself. Today, on 4th October, the world's 1.2 billion Catholics are celebrating the life and legacy of a man who has inspired whole movements, lifestyles, films and countless books since his death: St. Francis of Assisi. Indeed, St. Francis is the "the man of poverty, the man of peace, the man who loves and protects creation" who provided the inspiration for the chosen name of the current pope. 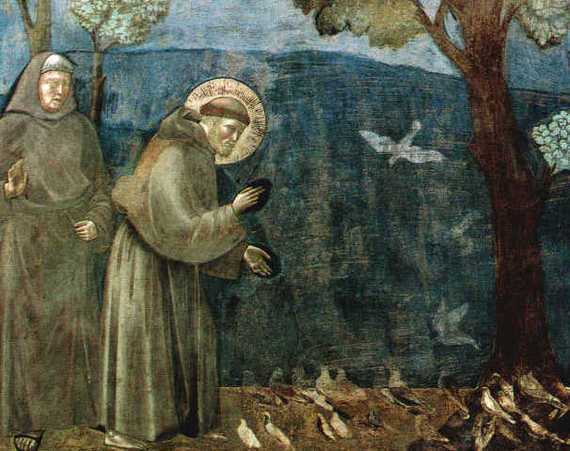 Despite living 800 years ago, St. Francis - famed for his humble devotion to poverty, his harmony with nature and as a writer of prayers of sublime beauty - still has much to teach us, Catholics and non-Catholics, as we confront the complex challenges that currently face our society. We face no greater challenge today than that posed by climate change. The vast majority of climate scientists tell us that increased concentrations of greenhouse gases in our atmosphere are trapping infrared heat before it escapes into space, leading to a dangerous increase in average temperatures on the Earth's surface and accompanying changes in the climate. In concrete terms, this means sweltering record-high temperatures approaching those the likes of which we have not experienced in the last 11,700 years during which humankind has flourished. It means more frequent and intense heatwaves in regions from South Asia to the Middle East. It means deadly floods in Louisiana in the US in September and floods in France in June that caused one billion euros worth of damage. It means melting glaciers and heavy rains in Italy. It means an increased risk of forest fires in Brazil. No demographic group is spared from climate change, though of course it is the poor that suffer most. 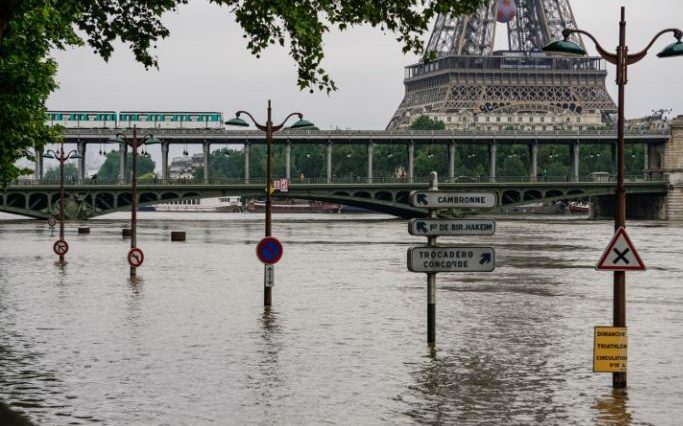 Paris floods in June after downpours linked to climate change. Credits: The Telegraph/Yannis Vlamos. Humans are far from blameless in this, and we know it. The combustion of fossil fuels such as coal, oil and gas is the main driver of this problem, as it emits greenhouse gases like carbon dioxide into the atmosphere. Furthermore, widespread and unsustainable deforestation can cause immense damage not only to biodiversity and displaced indigenous communities but also to the forest's capacity to absorb carbon dioxide in vast quantities. Contemplating this situation, it is no wonder that Pope Francis turned back to St. Francis of Assisi for inspiration when he wrote his June 2015 eco-Encyclical Laudato Si', the title of which, translated as "Praised be", is taken from the saint's hymn Canticle of the Creatures. Like St. Francis's song of praise to Brother Sun and Sister Moon, Laudato Si' has since emboldened many others to take action: the Global Catholic Climate Movement, a coalition of 400 Catholic organizations, has led a Laudato Si' Week campaign as part of which thousands of people learnt more about the Encyclical's message and pledged to care for Our Common Home in concrete ways. Just today, religious institutions from different continents have pledged to take their investments out of the fossil fuel companies that continue to contribute to climate change. The ecological crisis we face is so severe, however, that groups of individuals and organizations cannot resolve it alone. Through their policies and pledges, governments must create the conditions for effective climate and environmental action to flourish. Progress is being made: at the end of September, several major emitters of greenhouse gases reaffirmed their will to be bound by the terms of last December's historic Paris Agreement on Climate Change by officially ratifying it. Despite worrying statements from countries like Poland who seem to have misunderstood the core messages of Laudato Si' and continue to invest heavily in coal, globally investment in renewables is rising and the outlook for coal is bleak. The complex nature of the challenge and the limitations of the Paris Agreement mean that much still remains to be done in other fora, however. 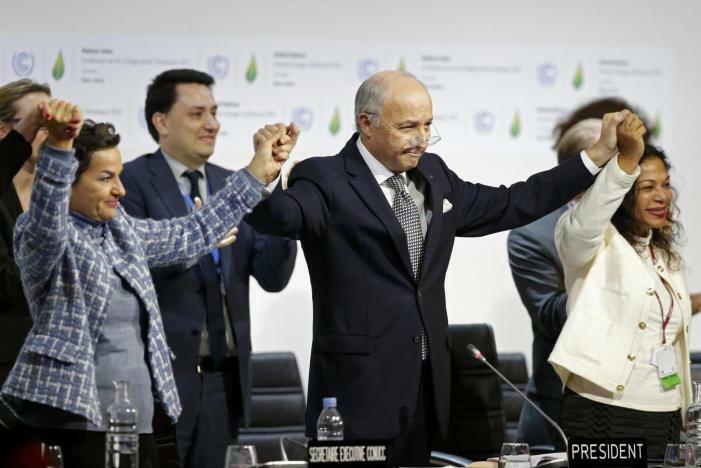 Celebrations last December in Paris as the gavel comes down on the Paris Agreement. Credits: Reuters/Stephane Mahe. Before the end of the year, countries have several opportunities to prove they appreciate the full gravity of the situation. As I write, 191 governments are gathered at the International Civil Aviation Organization (ICAO) General Assembly in Montréal in an attempt to curb greenhouse gas emissions from aircraft. Given that the ICAO General Assembly only meets every three years, it is vital that countries reach an ambitious deal to ensure that, by 2020, carbon-neutral growth is achieved. When they meet for COP22 in Morocco in November to discuss the finer details of the Paris Agreement, countries must similarly ensure they show the same spirit of ambition that was crucial to the success of Paris itself. Pope Francis was unequivocal about the importance of this next step in a recent seminar entitled "Laudato Si' and the Path to COP22" at which I and over 40 distinguished scholars and leaders from various sectors discussed these matters with His Holiness. As I have outlined in a paper submitted at that conference, all of us - from countries to individuals to the Catholic Church itself - have a role to play in contributing to a positive outcome at COP22. 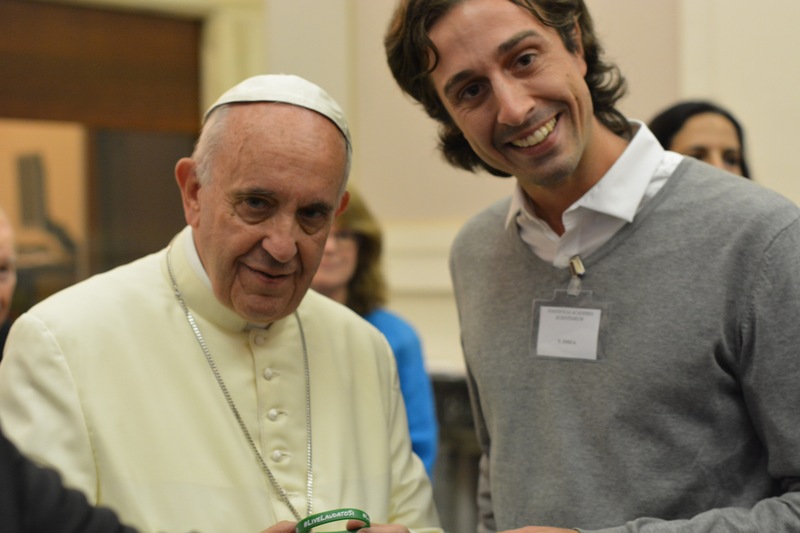 Pope Francis wears a GCCM #LiveLaudatoSi wristband at a recent seminar. Let people of all faiths and none therefore take this, the last day of the month-long Christian Season of Creation during which Christian leaders have asked people around the world to pray for the environment, as an opportunity to reflect on our relationship with the world around us and work in solidarity to preserve what is most precious to us by meeting the challenge posed by climate change. For, to apply the words of St. Francis to a problem that affects us all and that we can only solve together, it truly is in giving that we shall receive.